The inevitable reboot of the 1995 classic family film. This time around, 4 teenagers are being sucked into a jungle after playing a video game. In order to make it back to the 'real world', they have to work together and finish the game by becoming the characters themselves. Unpretentious and fun. Jumanji: Welcome to the Jungle is directed by Jake Kasdan and was released on Dec 20th, 2017. 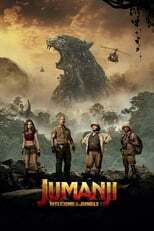 Director Jake Kasdan's Action & Adventure movie Jumanji: Welcome to the Jungle is produced by Radar Pictures & Matt Tolmach Productions & was released 2017-12-09.